Room was tired and carpet needs replacing. Otherwise very roomy and spectacular view. Great location, fantastic views. Helpful and friendly staff. Great base for exploring the rocks and harbour. Lovely place to stay! Wonderful staff, great location! 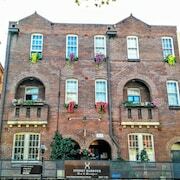 Situated in The Rocks, this hotel is steps from The Rocks Markets, Overseas Passenger Terminal, and Colonial House Museum. Great place, plywood-hard bed Best hostel I've stayed in, ever. BUT, the beds are so firm that it killed my back. Otherwise, is great. Awesome kitchen. LOCATION can't be beat. STAFF super helpful. They Even sell breakfast at a fair rate. Coffee topshelf. Regardless of your age, go for it. I really loved the feel of this place. It was homely with a lovely character about it. Really comfortable bed too! Only 5 mins walk to the train station so very handy. Afflicted with FOMO? Spoil yourself with a break in The Rocks. Located 1 kilometre from central Sydney, it's a fantastic place to stay while checking out New South Wales' capital. Start making amazing memories (and taking some brag-worthy selfies) at Bondi Beach, Sydney Opera House and Sydney Harbour Bridge, just some of Sydney's most iconic attractions. If you're keen to find a comfy bed near the Sydney Opera House, take a look at the Park Hyatt Sydney, Pullman Quay Grand Sydney Harbour, The Darling at the Star, Quay West Suites Sydney and Establishment Hotel. If buildings could speak, Elizabeth Bay House would be full of stories of generations past. Plan a visit and discover the local history. You'll find a couple of hotels not too far away. 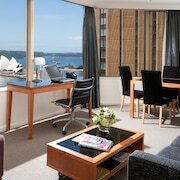 The Langham, Sydney and Fraser Suites Sydney are sensational spots to get some shut-eye. Overflowing with captivating tales, a tour of Fort Denison is a must. Check out the Sydney Harbour Marriott Hotel at Circular Quay and Harbourside Apartments if this attraction is higher up on your must-do list. Saved your pennies for incredible adventures and just want to use your room as a base? We get it. Though, that said, sometimes the hotel room can be the experience! 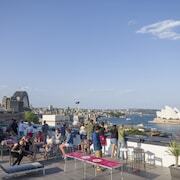 If you believe us, splurge a little at the Holiday Inn Old Sydney the Rocks. If you feel like sitting down with a strong coffee, The Fine Food Store is within cooee. Why not spoil yourself with a sweet treat while you're there? After all, holidays are for indulging, right? 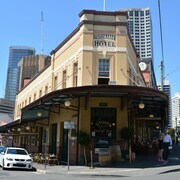 Having trouble securing the ideal The Rocks hotel deal? 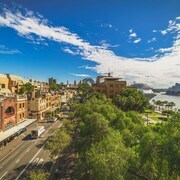 Don't lose hope — there are plenty of options in Circular Quay - The Rocks and Sydney. From hotels to flights and hire cars to experiences, we'll make it a piece of cake! All you have to do is rock up and start spamming your #GlobalTraveller pics.